Whether you’re starting from scratch, or an old hand at running the 4-2-5 Defense, I can help you get better. Now I won’t be working any miracles. I can’t make your players bigger or faster – only genetics and a great off-season program can do that. But I will help you put together a sound, effective defensive strategy. I will help you get your players in the right positions. I teach teach you to run stunts, blitzes and coverage packages that keep Offensive Coordinators guessing. The 4-2-5 Defense, also called the 4-4 Defense (yes, they’re the same!) has quickly become one of the most popular defenses in football today. It doesn’t matter what level you’re coaching at either. This defense has stood the test of time, and adapted over the years to shut down a huge range of offenses. My Coaching the 4-2-5 Defense eBook manual is going to show you exactly how to get the job done. If you’re having to make massive changes to stop the Wing-T one week, the Zone Read the next, and the Air Raid one week later? You should not have to. Running the Defense of the Week is a sure-fire recipe for disaster. Run the defense that can line up against ’em all, and stop them all. 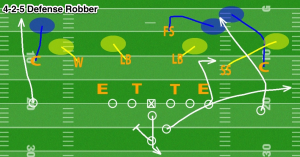 The complete break down for Run Fits against some of the top run plays in football today. You have to understand the run fits to stop anybody! You want to win? Don’t beat your head against the wall. Most of the work has already been done. You just need to master it, and pass the teachings on to your players. Once they know how to do their job, and how it fits into the big scheme, they’re going to play faster. Confidence does that for kids – the confidence in the 4-2-5 Defense I’m going to give you, to pass on to them. I’ve been through a lot of defensive manuals and been left with a lot of questions. They never seem to answer everything. Playbooks will show you some great pictures, but they will not give you the How and Why of a defense. This manual was written with that in mind. I wanted to give you a complete installation guide, one that you could take piece by piece as you choose, or use as your Defensive Bible. I teach sound, common sense principles to create a rock-solid defense from front end to back end. This isn’t wild theory, and its not something you need Division I Athletes to run. This defense is designed to let average players do great things. With a 7-man front you have to two-gap somebody. That means it gets complicated. The 4-2-5 uses an 8-man front where each player is assigned to a gap. The fits are simple, and can be installed in minutes, not days. One Coverage or Multiple? You Decide. Regardless of level, the elements of your coverage package are here. Keep it as simple as you want, running just Cover 3, or ramp it up. Chapters include Man Coverage, Robber and Quarters coverages. We do not benefit from having a million ideas. We benefit from having a strong foundation of fundamental techniques that we can teach to our kids. Coaching Football’s 4-2-5 Defense includes strong fundamentals and techniques you can teach your players. We focus on what you need to win football games. We are following the K.I.S.S. method here, and that’s the best way to approach the game. If you are teaching a new defense every week, your kids are not playing at their maximum speed because they are running around confused. Football is not as complicated as many of us make it. There’s absolutely no risk to try this eBook and see if it can change your Football Fortunes. You have a 60 Day, No Questions Asked Money Back Guarantee. I’m confident in what I’m selling you. Over 2,000 Football Coaches already have purchased Coaching Football’s 4-2-5 Defense and started building a better defense. They come from all 50 states, Canada, Mexico, Japan, Australia and throughout Europe. This probably sounds like bragging, but it is truly humbling. My manual on coaching the 4-2-5 Defense has influenced football throughout the world. I want you to do the same. And you shouldn’t have any reservations about it. If my 4-2-5 Defense won’t help you, you get your money back. No hassle, no questions, just a refund and my appreciation that you gave it a shot. 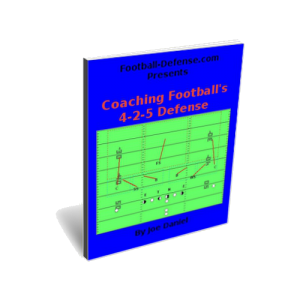 Get Coaching Football’s 4-2-5 Defense eBook for Instant Download, NOW! You have Nothing to Lose! My 60 Day Money Back Guarantee will cover you. 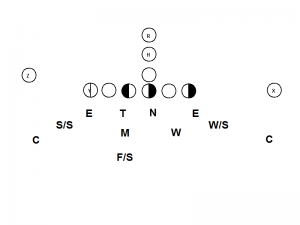 So download Coaching Football’s 4-2-5 Defense eBook right now. Now Let’s Shut ’em Down!